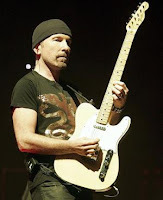 U2 guitarist/singer The Edge (David Evans) wants to build a compound in the Malibu hills and some conservationists are hassling him. He needs look no further than the Chesapeake Bay Foundation in Maryland as an example for him to emulate. They built 'an environmentally friendly' office right on the shore of the Chesapeake Bay. And conservationists celebrated it because it was so 'environmentally friendly.' Ugly as hell, but 'environmentally friendly.' So tell those folks bothering you to give the Chesapeake Bay Foundation a call. The project proposed by The Edge calls for a cluster of five, 10,000-square-foot homes. The two-story, earth-toned dwellings would be the maximum size allowed in areas designated as environmentally sensitive habitat. Renderings show organic design features such as a pool that encircles one home like a moat. Another house would wrap around an existing pile of boulders while The Edge's own dwelling would feature curved roof lines to simulate leaves. The Edge is also proposing to dig an access road up the mountain behind the exclusive Serra Retreat neighborhood of about 90 homes. The Edge can donate one of those five homes to us so we can use it as a West Coast office/residence? 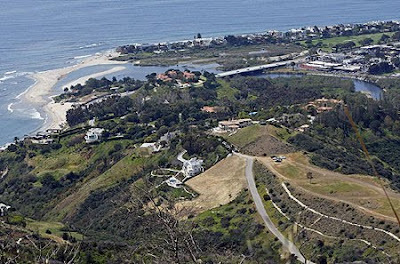 We love the scenery of the Santa Monica Mountains, the Malibu Pier, Surfrider Beach and the Pacific Ocean. Pacific Coast Highway is our favorite in the whole country. We would also love to be able to hang out in the exclusive Serra Retreat neighbourhood. Critics worried that the project could cause an environmental disaster should look at the news. There are always mud slides and wildfires in those hills. Ever heard of earthquakes? Build your little road and run a water line up there David. Many others have. You work hard and you deserve the view. Plus you are environmentally sensitive and we are sure you would be as 'delicate' with those hills as the Chesapeake Bay Foundation was with their waterfront area. The Edge intends to have the homes Gold LEED Certified by adhering to the greenest building standards requiring use of recycled materials in construction and environmentally friendly amenities to reduce energy consumption. Among other features, the homes will have native landscaping, electric vehicle charging, solar panels and onsite wastewater treatment. Nice. Don't forget to give us a call David. Before you break ground.